Ninety gorgeous acres in the foothills of the Ozark Mountains, with a 6 bedroom, 4 bath, 3300 square foot log home. Four miles from Ozark National Forest, surrounded by live water (spring fed creeks) on 3 sides. Stunning 90-acre spread in the foothills of the beautiful Ozark mountains includes a 6 bedroom, 4 bath log home. 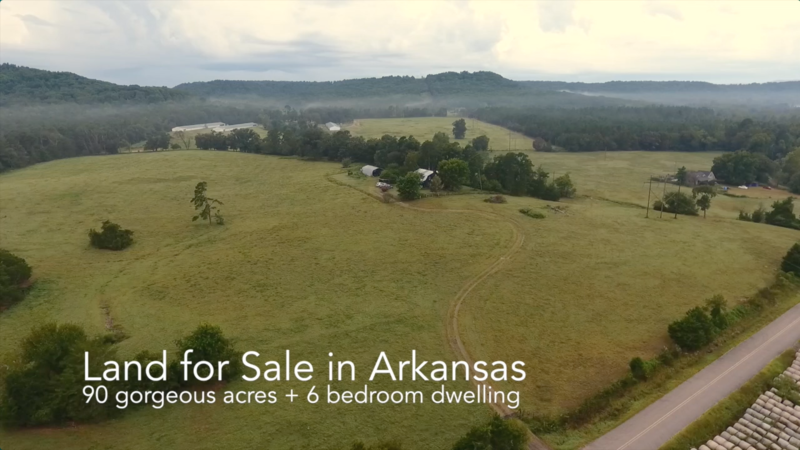 If you’re looking for a great home on some gorgeous acreage in the hills of Arkansas, you’ve found it! This place is so beautiful you’ll never want to leave. The house was built in 1980, with flooring and center-cut virgin timber over 150 years old! This single-owner home has SO much character, and is matched by its surroundings. The 90 acres it sits on has a big pond and several creeks, including year-round live water bordering on 3 sides. The property is only 4 miles from the Ozark National Forest, in an area rich with deer, wild turkey, rivers and lakes, and endless opportunities for other outdoor activities. I was a sophomore in college when my family built the house, so I personally peeled the bark of the logs, and helped build it from the ground up. The 100-year-old tongue-in-groove pine flooring is a full 2” thick, and the exposed timbers holding up the house are center-cut virgin pine, harvested locally from the Ft. Smith area over 100 years before we built the house in 1980. The timbers and the flooring were reclaimed from a warehouse in Ft. Smith, of which we found some photos that dated pre-1880. Being a 6 bedroom log house, it would be just as perfect as a hunting lodge as it has been a family home for a couple generations. -The big tree by the back porch is one we cut down during construction, but it grew back bigger and better than it ever was! -My family bought the farm, which is in Johnson County, in 1975 from an old man named Vandilla Voss (his real name!). The peach orchard was sometime before him. There is so much more I could tell you, but you really have to be there and experience it for yourself to understand what an amazing place it is. It won't be on the market long, so call soon! They are asking $500,000 for the entire thing - house, barn, etc. plus all 90 acres. If you’d like to hear more, or schedule a visit, please call Don Davis at 479.885.3186.